Jacquard ‘Bulk iDye’ is the cost effective solution for dyeing larger quantities of fabric in a washing machine. Each 454g pot is resealable and contains sufficient dye for up to 43kg/96lb of dry weight fabric (equivalent to 32 packs of 14g iDye). Bulk iDye comes in 10 vibrant colours for 100% natural fabrics such as cotton, silk, rayon, viscose, wool, and linen. 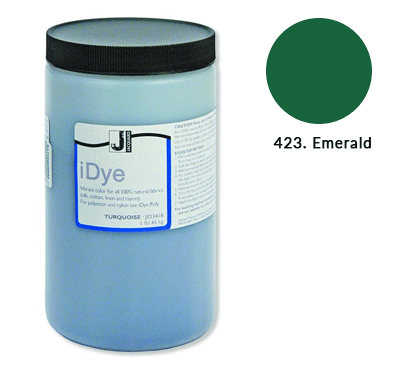 Bulk iDye is ideal for dyeing large home furnishing items like sofas and curtains. It is also used extensively for dyeing costumes and props for all types of theatrical productions. The ultimate easy way to get gorgeous colour!